Today we'll finish reviewing the different types of physical modeling synthesis and move on to how it has been implemented. A waveguide is a mathematical model that emulates the medium in which the waves evolve, often a string or a metal or wooden pipe, which serve as the waveguide. A waveguide is essentially made up of at least one so-called "delay" line. In other words, a digital device that simulates, on one hand, the time it takes a wave to go from one place to another. And, on the other, the behavior of the wave when it reaches the end of the delay line (simulating a bridge, in case of a virtual string) or when it reaches another delay line (a delay line network simulating much more complex environments than a string). In this example, the delay lines emulate the behavior of the two waves created from the hammer's impact point, and the waveguide is the entire device simulating the piano string.A classic example to illustrate what a waveguide and a digital delay line are is the emulation of the behavior of a piano string. The string is hit by a hammer at the center. Right at that moment, two vibrations are created. These vibrations travel in opposite directions along the string until they reach the corresponding bridges at both ends. 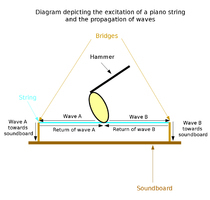 Then, part of the wave's energy is absorbed by the bridge, while the rest is sent back along the string. 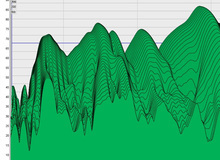 Both waveforms meet again at the impact point and eventually generate interferences or phase phenomena. This form of synthesis appeared in 1983 and it takes its name from its two discoverers and theorists. Its operation principle takes a lot from two of the previously mentioned synthesis forms, MSW and waveguide synthesis, and it is based on the following principle: The exciter signal is sent to a delay line that's closed in itself. A low-pass filter processes the signal with every loop, which results in the high frequencies being attenuated gradually until they disappear completely. 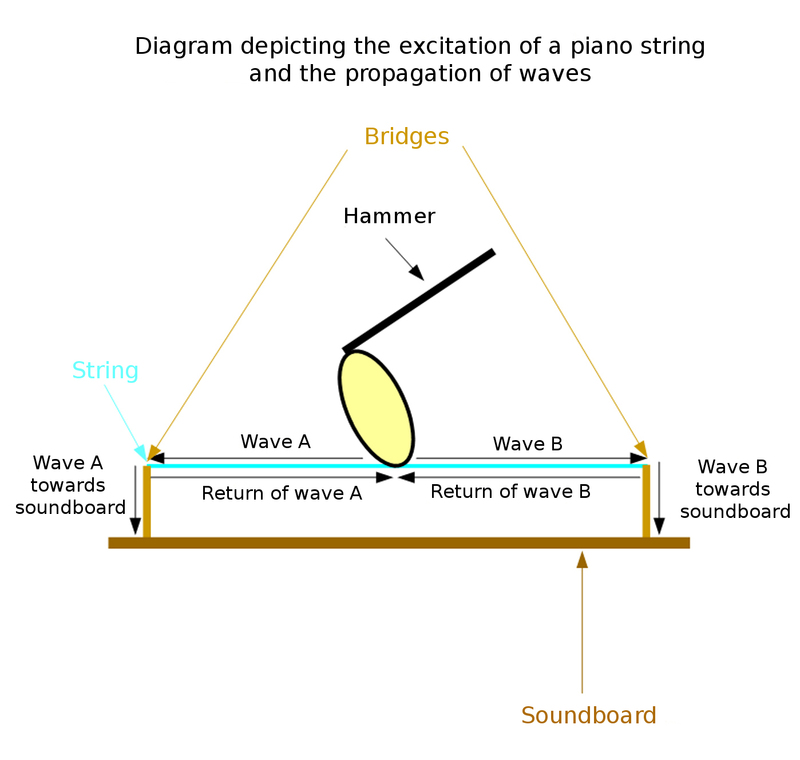 This represents the typical behavior of a string in vibration, making the Karplus-Strong a model that is particularly well-suited to reproduce strings, especially plucked strings. But it is also pretty effective when it comes to reproducing drums. As you have seen, physical modeling synthesis distinguishes itself due to its capacity to recreate the production and propagation conditions of a previously known audio signal, like the sound of a piano or a trumpet. This type of synthesis steps directly into the territory of sampling-based synthesis. But it offers two major advantages. Firstly, it isn't based on samples, but algorithms. 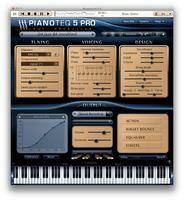 This makes it possible to recreate more precisely all the intentions of the musician. Take for example a parameter like velocity (see article 12). In the best-case scenario ─ which still doesn't exist ─, sampling-based synthesis uses one sample per velocity level. Physical modeling synthesis doesn't have this limitation. The second advantage, which follows from the first one, is that PM synthesis allows you to go beyond the physical limitations of classic instruments and environments. Thus, you can create all sorts of "chimeras," like a 25-meter horn or a piano whose strings are triggered by a blast of air, for example....or even much more surprising things. You can even emulate the musician himself/herself, his/her dexterity, tiredness, etc. Like with FM synthesis, Bell Labs is at the origin of the first applications of physical modeling synthesis. In the 1960s, they made a computer modeling a human voice perform a song (in a way reminiscent to a particularly famous scene from Stanley Kubrick's 2001, A Space Odyssey). Nowadays, several hardware devices use physical modeling. After having promoted FM synthesis in the 1980s (see articles 21 and 22), Yamaha once again showed off its pioneering spirit in the '90s, introducing the first genera-public units featuring physical modeling, namely the VL-1, VP-1 and VL-7. 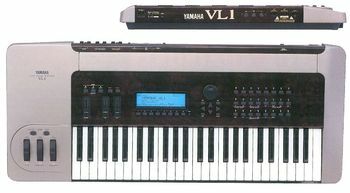 Other machines based, at least partially, on this technology are the Roland V-Piano, Clavia Nord Modular G2 ou encore les Korg OASYS and Prophecy. When it comes to software, apart from Modalys, which we mentioned before, you also have CORDIS-ANIMA, created in the late '70s by the French Association for the Creation and Research on Expression Tools (ACROE). It presents itself as a "multi-sensory" force-feedback tool (like a joystick, for you gamers out there) and it promises to apply physical modeling techniques in the service of audio (CORDIS) and image (ANIMA). 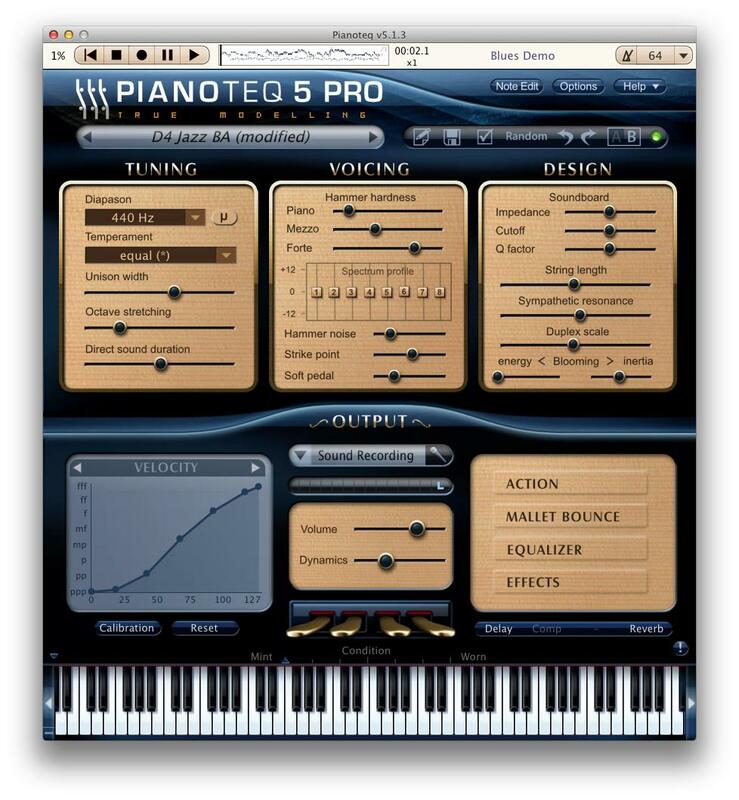 Within a more recent and wider-reaching domain, you have the famous Modartt Pianoteq, which allows you to access all adjustment parameters of different acoustic and electric pianos, and Arturia's Brass for wind instruments. Physical modeling synthesis can also be found on quite a few of the virtual instruments that come with Ableton Live, namely Tension, Electric, Collide, and Corpus. And it is obviously present in modular environments like Native Instruments' Reaktor and even Cycling’74's MAX/MSP platform.